When you enter to win the Show and Tow Dream Giveaway, you’ll bring home a grand-prize package that’s guaranteed to get your heart racing — a fully restored 1969 Camaro sport coupe with restomod upgrades from bumper to bumper, a brand-new 2019 Chevrolet Silverado High Country 4x4 truck and a Sundowner open car hauler. Plus we’ll pay $30,000 for the taxes. 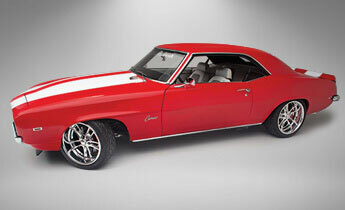 It’s been 50 years since the 1969 Camaro became the most popular youth car ever produced by Chevrolet. Now, thanks to big-dollar technology, you can win a classic Camaro that blends the ageless cool of old-school style with the high-tech wizardry of today’s popular restomod restorations. 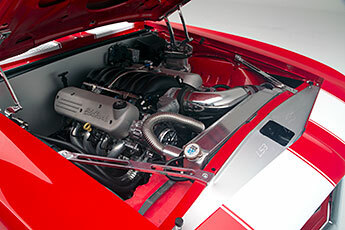 Look underneath the hood of this classic 1969 Camaro and find a complete driveline solution from today’s Chevrolet – a LS376 Connect and Cruise System. 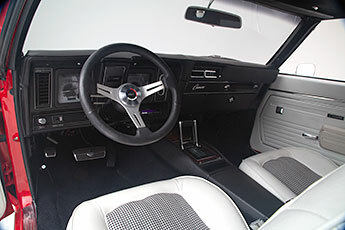 Chevrolet engineers took all of the guesswork out of a modern driveline for this classic Camaro. 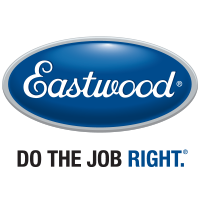 Their classic-car retrofit engineers matched the engine and transmission for optimal performance and durability, so you can wring out all the horsepower from them with total confidence. The LS376 is a high-output variant of the fantastic engine behind the Chevy Corvette and Camaro SS. It's rated at a whopping 480 hp in the new Crate Powertrain System, offering the lightweight advantage of an aluminum cylinder block, aluminum heads and composite intake system, weighing in at 404 lbs, significantly less than even the storied small-block. It's backed by the 4L70-E four-speed overdrive automatic transmission for relaxed highway cruising, with the durability of hardened internal parts and five-pinion gear sets. 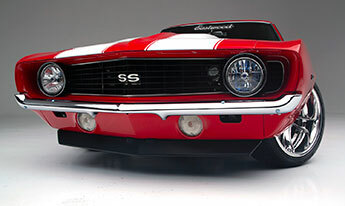 Thanks to contributions from SEMA’s most advanced classic-car performance companies, enter and win and you’ll take this grand-prize classic Camaro into trailblazing territory with the ride, handling and braking of a new sports car. 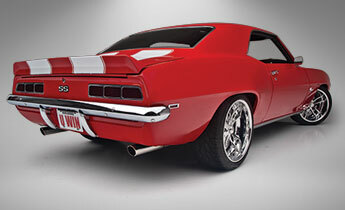 In fact, everywhere you look on this iconic 1969 Camaro, you’ll find SEMA-quality restomod upgrades galore. Let’s start at the bow of this bad-boy Camaro, where the great-for-its-day 50-year-old cast-iron subframe has been replaced with a bolt-in Total Cost Involved Pro Touring independent front suspension (IFS). Pre-fitted with Ridetech coilover shocks, a performance sway bar and Wildwood Superlite four-piston brakes, this driver-friendly front clip is expertly engineered for performance driving while providing the ultimate in handling, weight savings and strength. Whether you cruise to the car show on a Saturday morning or tear up the track on a Saturday night, this grand-prize Camaro has got your corner-carving cravings covered. Now let’s move to the stern. Once again, Dream Giveaway Garage turned to the restomod experts at Total Cost Involved for their Torque Arm Rear Suspension designed to eliminate the bind that occurs when cornering using the stock conventional leaf spring suspension. Pre-fitted with Ridetech coilover shocks and featuring a bulletproof Currie 9-inch rear and Positraction, the kit allows for a lowered stance, greater rear axle control and dramatically improved handling. Bringing this high-performance, grand-prize Camaro to a stop is a breeze, thanks to four-piston Wildwood big-brake calipers clamping down on 12.8-inch rotors. Controlling the brake-fluid delivery to the clampers is a Wildwood Dual Tandem Master Cylinder with Power Assist. Let’s not forget the wheels – stunners in their own right. Billet Specialty 18-inch Velocity wheels wrapped with Continental Extreme Contact rubber give this grand-prize Camaro a custom, old-school vibe that rides as good as it looks. A Camaro with Creature Comforts? It’s True. 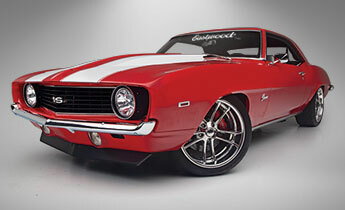 Strap yourself into the pilot seat of this classic Camaro and be surrounded by the latest in advanced restomod technology. You’ll enjoy the style and comfort of TCI Sport bucket seats with retro houndstooth upholstery, the style and ease of an ididit steering column, Dakota Digital VHX retro gauges, a Vintage Air Gen IV climate control system and a Kenwood sound system. Classic style plus modern performance and reliability make this restomod 1969 Camaro the first of its kind in Dream Giveaway history. Are you ready for the biggest smile of your life when you enter and win? Enter to win and you could take home this 1969 Camaro and a 2019 Chevrolet Silverado High Country Edition 4x4 truck plus we pay $30,000 for the taxes. We’ll fly the winner to Clearwater, Florida, to get the keys to this grand-prize package.